The Droid TV T5 is the first Android mini PC we know of that includes a webcam on it’s case. In search of a better Android TV top box, the Droid TV T5 developers got the -right on spot- idea of including a 2 megapixels camera coupled with a microphone, perfect for some skype couch sessions. This welcome addition is not alone: The Droid TV T5 includes other surprises, like both HDMI and VGA video ports. Definitely, the Droid TV T5 packs a punch. Powered by an Allwinner A10 CPU, int includes 1Gb of RAM and 4Gb of flash ram. THe Droid TV T5 comes preloaded with Android 4 Ice Cream Sandwich including the Google Play store client, so you won’t find yourself lacking for apps and games to throw inside it. Other complementing specs of this nice Android TV BOX are the included WIFI 802.11 N/G/B and an RJ45 ethernet port. On the audio side you will find an S/pdif output and an earphone port. The Droid TV T5 includes also 2 USB 2.0 ports, and an SD Card slot. 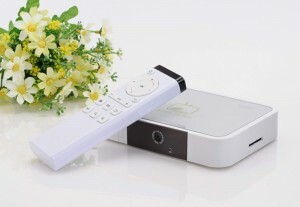 On the pricing side, at this time you can find the Droid TV T5 on chinese stores like aliexpress for about USD 83, which seems quite a nice price, considering the interesting additions this tv box si throwing into the deal.